Tesla said Tuesday it will attempt to go private at $US420 per share, or an $US81 billion total valuation. Bears like Cowen say that the company’s current fundamentals don’t support the price proposed by CEO Elon Musk. 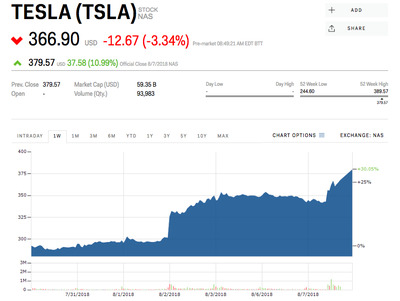 Shares of Tesla rose more than 10% Tuesday on the news. Tesla’s sceptics still aren’t convinced. In a note to clients Wednesday, Jeffrey Osborne, an analyst at Cowen, said Tesla’s current fundamentals don’t support a valuation anywhere near the $US420 buyout price CEO Elon Musk tweeted on Tuesday. While the company confirmed nothing has been set in stone, Musk said on Twitter that financing had been secured for the buyout. In a letter to shareholders, Tesla laid out how the process of going private might work, comparing it to Musk’s other company, SpaceX. The move enticed investors to bid up Tesla’s stock price more than 10% – nearing an all-time high – on Tuesday. Shortly before Musk’s tweet, the Financial Times reported that Saudi Arabia’s $US250 billion public investment fund had bought a 3-5% stake in the company, which also boosted the stock. Still, the odd method of proposing the move left Cowen with more questions than answers.